Foreign Minister Bob Carr has this week warned that "it is illegal for Australians to join the uprising in Syria" [ http://www.perthnow.com.au/news/national/bob-carr-warns-aussies-not-to-f... ]. Senator Carr's 'message' to Syrian community leaders must have been all the more incomprehensible, though, given that just a day earlier he had suggested that the assassination of Syria's president Bashar al-Assad would somehow accommodate “the desire for change” among Syrians [ http://www.abc.net.au/news/2012-10-08/assassination-or-mass-defection-ne... ]. That is NOT much of a reason for exhorting such a brutal act and was essentially an insult to Syrian Australians who were (a) automatically expected to support Carr's dreams of invoking regime-change in a foreign land, and (b) approve of the murder of their home country's beloved president. It also tarnishes all Syrian Australians as pro-FSA 'rebels' (Free Syrian Army) supporters – that is, the group who would be assumed to carry out such an execution. But the fact that it was said in the Senate that “some Australians were joining the uprising” indicates that there is actually a breeding- ground for Al Qaida jihadists in Australia and that some group or association may be acting as a conduit. Again, that is an insult to Syrian Australians who mostly do NOT support the violent overthrow of the government in Syria. Recently, there have been pro-Assad demonstrations in Sydney, Melbourne, etc which prove that and can be seen on YouTube [search 'hands off Syria rally' + add the city]. Rather, the violent protest in Sydney recently about the US-made film Innocence of Muslims in which some radical extremist demonstrators carried placards demanding the beheading of “all those who insult the Prophet” was a vivid indication that there are Salafist (Wahhabist) organizations within Australia. The pro-sectarian Khilafah movement which today exists in Britain and Australia openly advocates the creation of a global caliphate (khilafah) under imposed Sharia law – which is essentially a kind of 7th century legalism, but NOT “God's law” as they imagine to suit their own divisive agenda. In doing so, the Khilafah movement routinely smears governments of Muslim countries which do not impose Sharia on their citizens and even those who do in some form if they are not of the same sect in Islam. Thus they are ideologically aligned with Wahhabist sectarian regimes such as the Gulf states, Saudi Arabia and Qatar, which have themselves recently admitted funding the murderous insurgency in Syria. It may be convenient for countries in the West (US and NATO allies) to allow these groups to exist within their own states but they actually do not 'share our values' in any genuine sense at at all. It is thus shameful for Australia's Senate to accept that our foreign minister, Bob Carr, has gone on national television to make a lengthy statement that was simply to the effect that he would like to see Syria's president murdered. 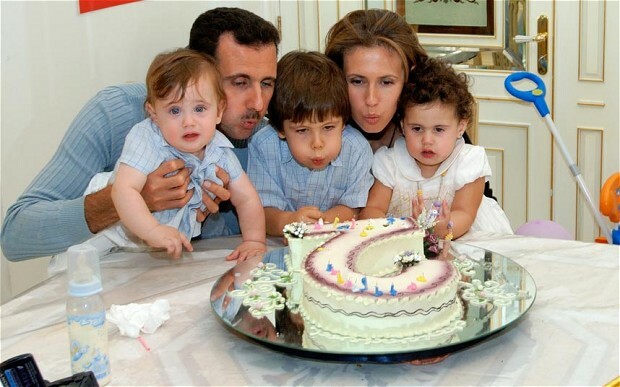 Presumably, such an act would most probably also incidentally include the murder of al-Assad's beautiful wife and their three lovely young children, uhh! [see picture http://2.bp.blogspot.com/-Pe42CcJUrxc/UAwfA7sU4AI/AAAAAAAAp7U/T5Iw9zZh7g... ]. Also see the Four Corners program with the video of Bob Carr here... [ http://www.abc.net.au/4corners/stories/2012/10/04/3603727.htm ]. But, as for Bashar al-Assad, he is a doctor and a surgeon as well as his country's leader and perhaps unwillingly since his father died and facing the struggle of having adversarial nations on Syria's borders. He is not 'an evil dictator' as has been portrayed in the West but he is a better politician than most of the incompetent loud-mouthed lawyers who make up the pathetic political scene in Western democracies as well as being a true gentleman [see his Ramadan speech in 2011 + click 'captions' for English text... http://www.youtube.com/watch?v=H28TTkKEZX8 ]. But for those Australians who do wish to join the uprising in Syria, they will make their way whether legally or not as did Sydney cleric sheikh Mustafah al-Mazjoub who died recently in Syria with the FSA insurgents. Regardless of their delusional fantasies though, the Syrian Arab Army will 'send them to Paradise' as soon as they do encounter them. They do NOT wish to see armed terrorists form foreign lands stomping about in their fair country. As it is, they would join many from Libya, Chechnya, Pakistan, Turkey and the Gulf states and emirates. “Public figures must think twice before commenting about someone’s death...” is a solemn warning to all these days but applies as much to prattling Australian politicians as to anyone else [ http://newmatilda.com/2012/10/10/carr-calls-syria-assassination ]. Bob Carr seems to think that his way of asking politely for 'someone' to murder Syria's president is not illegal yet one day he might find himself charged with war crimes in that respect at least. Given that a number of Syria's top government people were killed or injured in a recent bombing, it is weakly late of Carr to assume that “a major defection” could thus be precipitated. It has NOT happened. The idea that his inviting an assassination constitutes a “pre-conditions of movement towards peace in Syria” is essentially false as the problem with the conflict is that external forces are already extensively involved (FSA and their Al Qaida foreign fighters and mercenaries) and that they are being financed by states backing their own sectarian agenda with their $$petro-dollars. Then there is also the involvement of neighbouring Turkey which allows these insurgents to transit freely and even have bases within Turkey and despite the frequent protests by Turkish citizens in the border province of Hatay. Sadly, Bob Carr continues to prattle ignorantly about Syria with his latest 'op-ed' piece published both in The Australian and on his personal blog. His topic suggests almost apologetically that there are other things that Syria's people need more urgently than murdering an elected president of a legitimate government [“Let’s get doctors and medicine to Syria’s suffering people” - http://bobcarrblog.wordpress.com/2012/10/11/lets-get-doctors-and-medicin... ]. The fact is, though, that he has no real 'plan' and, worse, he also prefers NOT to have anyone post any critical comments on his blog. Despite the fact that I had posted a comment there which remained visible online overnight, it was removed the following day. For those who are interested, the text can still be seen on my FaceBook page addressing the issues Bob Carr has raised recently [ https://www.facebook.com/DouglasDChalmers/posts/377318752344383 ]. I had also posted a comment on the USA's Brookings Institution's latest topic on Syria which was also about aid for Syrians. They seem to have been able to accept my genuine criticisms openly even though our fellow Australian and political representative has boorishly refused [ http://www.brookings.edu/blogs/up-front/posts/2012/10/10-syria-idps-ferris ]. Thus, again Australia has been weakly caught out by a government whose senior members continue to act poorly as pawns for the perceived interests of international partners who are themselves far more capable on the world stage. Any real evidence that the Syrian government is killing Syrians? So if Bob Carr's justification for assassination is killing someone does that mean he would support his own assassination for encouraging the killing of someone? Anyone got any real evidence to back up the claim that the Syrian government is systemically killing its own people yet? All I have heard so far is speculation and stories of bombs getting fired with no idea where they have come from and people instantly blaming the government even tho we know 100% the terrorist rebels have access to military grade weapons as well. Support Syria's right to defend itself against western backed terrorists!